Assembled when ordered. Usually ships within 24 hours. Have a Question about Triumph TR7 & T140 Deluxe Belt Drive Kit - Kickstart Models ? Why you should consider a M.A.P. Cycle belt drive conversion. Compare our Exclusive features and see for yourself. Front Pulley is a lightened steel billet. Gold Zinc plated for great looks and maximum durability. Utilizes a double lipped, no leak seal. Includes replaceable belt retaining disc. Clutch basket is hardened aluminum for longest lift, and lightest weight. Saves up to 5 lbs of rotating weight for much improved throttle response, and more available power. Our clutch baskets uses and exclusive sealed, double bearing design, engineered and designed not only to stabilize the basket, but also for a maintenance and trouble free life. Clutch plates feature 12 tangs with 8 times more surface area of the stock plates for the best clutch action, and longest basket life without grooving. No loosening studs to worry about either. 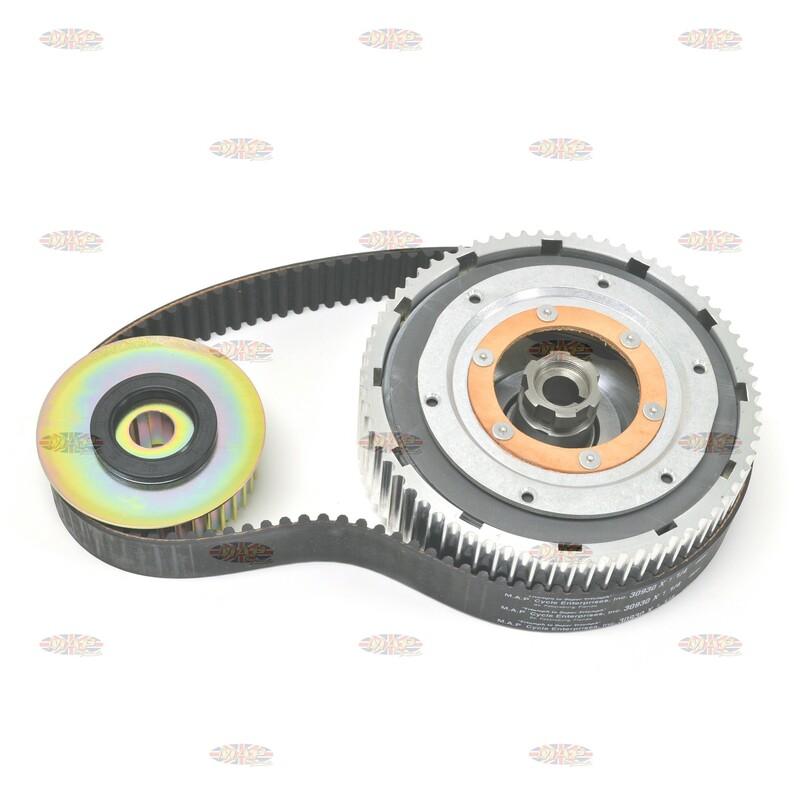 Exclusive dry clutch pack design eliminates missed shifts, and gear change grinding causing by sticking wet clutch plates. Retains O.E. shock absorber to reduce transmission stress. Decreased vibrations for a longer lasting engine, and transmission. Smoother power delivery. Proprietary Uniroyal HTD belt is unique, and exclusive only to M.A.P. Cycle. Our belts are specifically designed with 101 teeth, and a custom pitch to allow for the all important hot clearance. A seemingly loose belt when cold with tighten when hot. Tight belts will break cranks, and damage transmissions. Never use a tight belt! In-bounded design to reduce pull on the mainshaft. Our belts typically last 3-4 times longer than the stock chain. Note: This kit requires the use of a M.A.P. Cycle or other aftermarket ball bearing pressure plate (Not included). The stock pressure plate may not be used. Harris models, and E-Start models will require breather modifications.